After more than a decade tucked away on a Chinatown side street, this late-night institution moved to the main drag, with a second-story view of the area’s action. The dinner hour brings a nonstop flurry of cooks plucking lobsters, sea bass and Dungeness crab from the seafood tanks, but after 10pm, it’s drunken dim sum time. All the fried classics are suitable stomach lining, but we say meet in the middle with the late-night menu of small-plate portions of garlicky peapod greens, salt-and-pepper pork chops and tender quail smothered in peppery black bean sauce. El stop: Red to Cermak/Chinatown. Bus: 21, 24, 62.
the Best Salt and Pepper shrimp! Hands down the best dim sum in Chinatown. Bring a couple friends and you can order as many dishes as your heart desires. Start off with a pot of oolong tea and take a hard look at the menu because there are about 70+ dim sum dishes to choose from. The best part is that the dim sum is rolled out piping hot, straight from the kitchen, on carts to your table and you point to choose what you would like. Getting to see what your food looks like and choosing based off how good something appears is pretty cool and fun. The waiter tallies your choices on a sheet and then you can dig in. Must have dishes include the siu mai (pork and shrimp dumplings), steamed BBQ pork buns, stuffed sticky rice, shrimp stuffed eggplant and BBQ pork crepes. 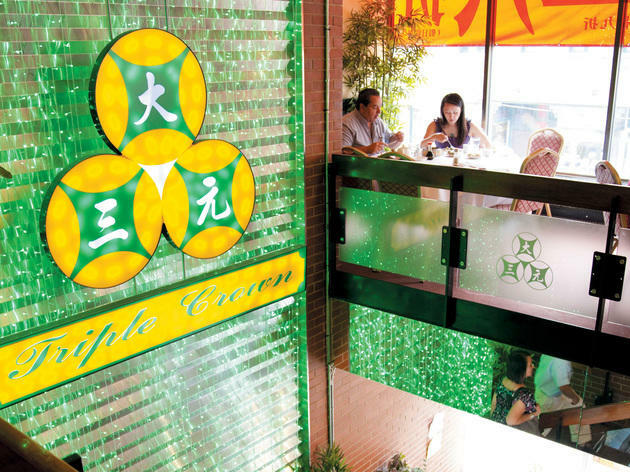 Triple Crown knows what they are doing when it comes to dim sum. 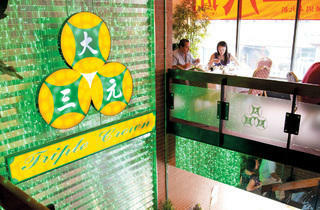 Expect crowds on the weekends but the dim sum is worth it. I absolutely love this place, their food is great especially the pot stickers. Would highly recommend eating here.